About six or seven inches long. Blue head, neck, back, rump and tail (lighter blue than the other bluebirds.) Grayish white underside. Black bill and eyes. 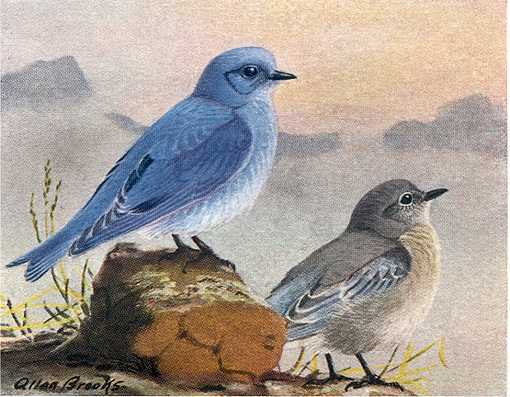 Inhabits the Rocky Mountains and higher elevated plains throughout most of western North America from southern Alaska, the Yukon, above Alberta in the Northwest Territories around the Great Slave Lake area, as far east as Manitoba, south to northern Mexico, overlapping both the Western and Eastern Bluebird ranges. Migrates to the U.S. and Mexico. Lays three to seven greenish blue eggs which hatch after about two weeks incubation and young leave the nest in about another three weeks. Forages for insects near to or on the ground. The Mountain Bluebird Birdhouse (same as for the western bluebird), has a 5″ by 5″ floor, 12″ inside floor to ceiling and a 1 9/16″ diameter entrance hole located 10″ above the floor and ventilation openings. This birdhouse will also accommodate eastern bluebirds and may be useful in areas where the mountain and eastern bluebird ranges overlap, in the western portions of the Dakotas and the border area between southern Manitoba and Saskatchewan. Mount bluebird houses 3′ – 6′ high on a post in woodland clearings, shelter belt edges bordering fields, among scattered trees, or pasture fence lines. Make a “bluebird trail” of several houses about 100 yards apart; further in wide open expanses and closer in clearings of wooded areas. Avoid shade, but also avoid direct sunlight through the entrance if possible. Monitor the boxes for unwanted squatters. Deter predators with steel posts or sheet metal wrapped around wood posts. Flycatchers, chickadees, titmice, wrens, nuthatches and woodpeckers may also use these boxes. Tree Swallow Birdhouses placed between bluebird nest boxes invite these good neighbors. The swallow nest box has a 5″ by 5″ floor, 8″ inside floor to ceiling and a 1 1/2″ diameter entrance hole located 6″ above the floor. Mount both bluebird houses and swallow boxes 3′ – 6′ high on posts in woodland clearings, shelter belt edges bordering fields, among scattered trees, or pasture fence lines.